Complexity theory, the understanding of underlying principles of complex systems, is seen by many as one of the future challenges in scientific research. Diverse approaches to the topic exist and different disciplines offer various interpretations of the term, ranging from computational complexity in computer science, to the theory of complex dynamical systems. Applications of these different approaches may be found in biology, physics, engineering, communications systems, computer science, economics, social sciences and mathematics. In Ireland there are many research groups working on specific problems in this area. The objective of the workshop is to bring these groups together to begin an exchange of ideas and to explore possible avenues of collaboration. We wish to provide a stimulating environment for interaction for researchers from various disciplines working in the area. Sponsored by Irish Research Council for Science, Engineering and Technology. For details, see workshop web site. 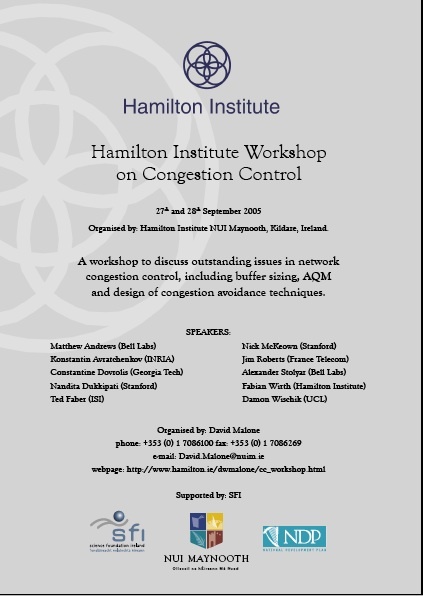 International Workshop on Network Congestion Control. Workshop to discuss outstanding issues in network congestion control. Topics for discussion will include buffer sizing, AQM and design of congestion avoidance techniques.